The Life and Times of Musical Theatre in Finland, part 1/4. Read this part in Finnish here. On Friday the 13th, 1899, musical history was made in The Finnish National Theatre. It’s a small wonder, though, that the show in question featured music at all. The songs had been written only a couple of weeks before, and the script had been revised all the way to the premiere. The writers didn’t believe their piece would be much of a success. Against all expectations, the all-Finnish musical comedy Tukkijoella was a huge hit. 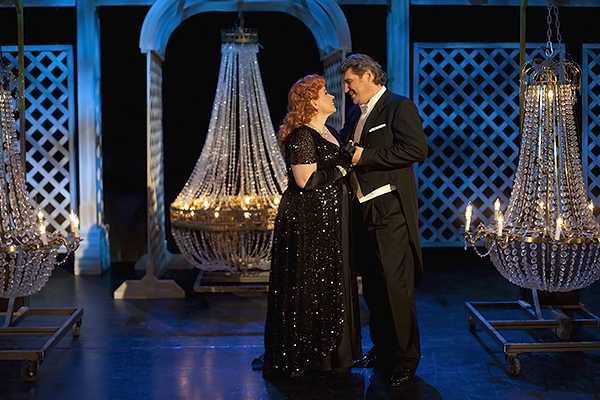 During its first season in the theatre’s repertoire, it was performed dozens of times for full houses. Even the usually restrained premiere audience laughed out loud. Written by Teuvo Pakkala and composed by Oskar Merikanto, both well-known Finnish artists, Tukkijoella has been produced in Finnish professional theatres more often than any other musical. It has been seen by more people than any other Finnish play. Since its premiere in 1899, it’s been revised in theatres all around the country over 130 times – and that number only includes fully professional productions! production of Tukkijoella. Photo from the theatre's archive. The show’s title, Tukkijoella, loosely translates as “We’re Log Driving”. In the main storyline, the daughter of a respected family is courted by the mischievous leader of a group of log drivers. The girl’s father is furious, until it turns out the log driver is actually a wealthy farm-owner. The father then gives the couple his blessing and the lovers get their happily-ever-after. In the subplots, a villainous servant of the crown is defeated and the other log drivers also find romance. “It’s a fine portrayal of the Finnish way of living, both the way it used to be and the way it still is. Friendship in between men is also an important theme of the piece”, director Pentti Kotkaniemi describes the story. Kotkaniemi directed Tukkijoella for Turun kaupunginteatteri in 2008. Tukkijoella is such a popular show that it has been adapted for film three times. 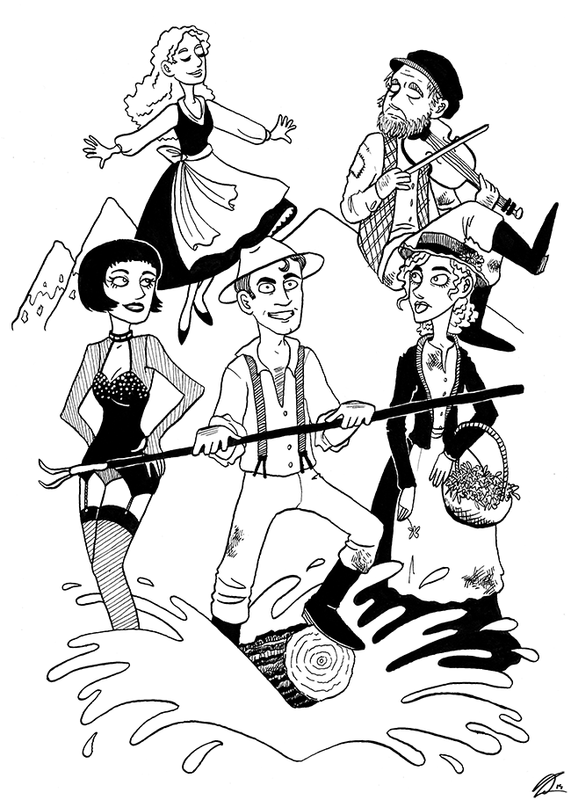 The musical play was turned into a silent movie in 1928. The silent film was followed by two all-singing-all-dancing versions, released in 1937 and in 1951. The number of film adaptations pales in comparison to the number of times Tukkijoella has been performed live in Finnish theatres. It’s been a hit on both professional and amateur stages all over the country. New amateur productions still premiere every year. Tukkijoella has even returned to the repertoire of The Finnish National Theatre – half a dozen times, most lately in the 70s. Tukkijoella has been seen as a guaranteed success for any theatre. Critics have thought the piece’s humor and energy, its charming characters and, nowadays, the audience’s nostalgia and appreciation for camp are keys to the show’s success. Tukkijoella is a comedy, but it can also have serious undertones. Tampereen Työväen Teatteri’s 1971 production added a new undercurrent about nature conservation into the story. The politic movements of the 70s also influenced the way Finnish audience interpreted certain aspects of the story. This revised version of Tukkijoella turned out to be a massive hit. The performances ran for eight years, and the play returned to the theatre’s repertoire in the 80s. The original production and the revival combined, Tampereen Työväen Teatteri’s Tukkijoella was seen by almost 250 000 people. It’s a number only a small handful of Finnish theatrical productions have ever been able to reach. 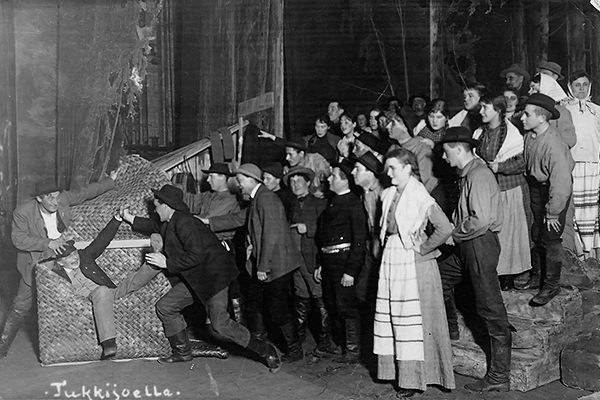 The production also visited Stockholm and went on a short tour of the United States – complete with a performance on Broadway. A scene from Turun kaupunginteatteri's 2006 production. 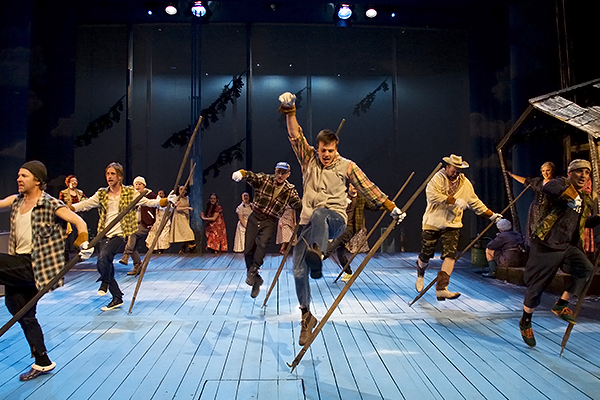 The latest professional production of Tukkijoella premiered in Turun kaupunginteatteri in 2008. “Directing this play was on my ‘To Do’ list ever since I saw Tampereen Työväen Teatteri’s production in the 70s”, director Pentti Kotkaniemi says. In Turun kaupunginteatteri, the 19th century play was brought a bit closer to the present. The log drivers wore modern jackets and worked with chainsaws. Kotkaniemi says that regardless of the visual changes, the production wasn’t a modern version of the story. Turun kaupunginteatteri’s production of Tukkijoella was seen by almost 18 000 people. But after the derniere, there has been a log jam on the river. 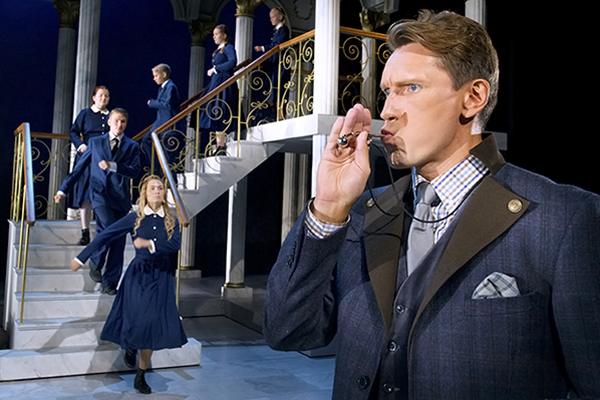 No professional theatre has produced Finland’s most popular musical in over six years. Despite this break in performances, Kotkaniemi believes that there’s still room for the classic in theatres’ repertoires. production of Countess Maritza. Photo: Jonne Renvall. Even though Finns’ number one favourite musical is a completely domestic work, Finnish audiences are also captivated by imported pieces. Maybe surprisingly, the list of Finland’s most often performed musical plays is not dominated by Broadway musicals but Hungarian operettas. Die Csárdásfürstin or The Gypsy Princess, Victoria and Her Hussar and Die lustige Witwe or The Merry Widow are all featured on the list of the musical plays most often produced in Finland. Hungarian operettas were especially popular in the beginning of the 20th century. They formed the backbone of many theatres’ repertoires. Nowadays, operetta isn’t seen on Finnish stages nearly as often, though new productions of old favourites still pop up every now and then. Certain Broadway musicals have also been very successful in Finland. Unlike operettas, their success continues to this day. 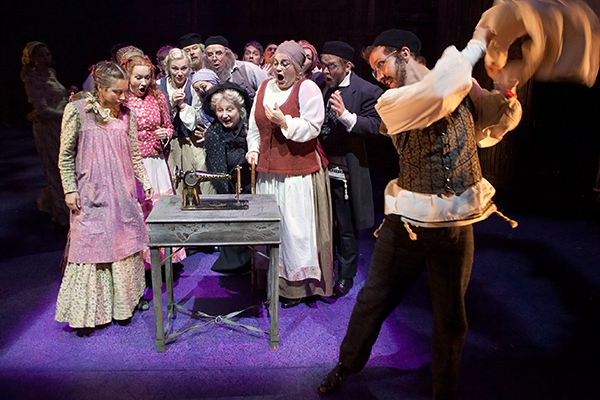 Fiddler on the Roof is Finland’s most popular American musical. The story about Jews being evicted from their village by the Russian Tsar has been produced professionally 48 times. Both the first Finnish Fiddler and the latest production of the classic were seen in Helsingin kaupunginteatteri. This theatre in the Finnish capital is the home to the country’s biggest musical productions. The original Finnish production of Fiddler on the Roof ran from 1966 to 1971. Over 319 000 people watched the musical. It’s the biggest audience any Finnish theatrical production has ever gathered. The 2012 revival ran for one season only, but the musical is still loved by theatregoers. The new production, with 71 000 spectators, was the most popular play of the 2012–13 Finnish theatrical season. Fiddler on the Roof. Photo from the theatre's archive. “The story of Fiddler on the Roof has not aged at all. Emigration is a universal theme”, Helsingin kaupunginteatteri’s manager Asko Sarkola says. Sarkola tells the cast and crew available influenced Helsingin kaupunginteatteri’s decision to bring the classic back in 2012. 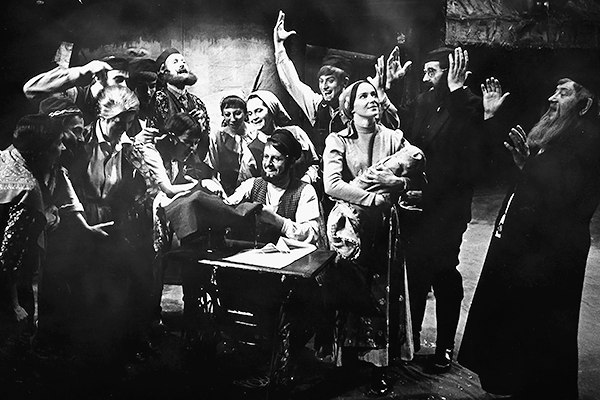 In the 60s, a part of Fiddler’s popularity could be explained by how people could identify with the story. The evicted villagers reminded the Finnish public of the evacuation of Eastern Finland after losing land to Russia after World War II. In the 60s, many Finns also moved to Sweden in search of employment. The 2012 version didn’t even try to live up to the huge success of the first production. Sarkola says a success like that is always a surprise. The new sewing machine still amazed the villagers in 2012. The list of Finland’s most popular foreign musicals is continued by The Threepenny Opera, Cabaret, My Fair Lady and The Sound of Music. New productions of these classics have lately premiered in professional theatres both big and small all around the country. This season, the love story of an aspiring nun and a militant captain takes the stage in Eastern Finland, in Kuopion kaupunginteatteri. The theatre’s manager Pekka Laasonen says the evergreen favourite was chosen for the repertoire to celebrate the theatre’s newly renovated building. Laasonen says the theatre considered dozens of Finnish, English, American and Central European musicals. They decided to go with the classic when they learned a surprising fact about it. Laasonen says the beloved piece was also chosen because it’s suitable for all ages, even children. What’s more, collaborating with the town’s orchestra gives the classic new energy. The Sound of Music. Photo: Ari Ijäs. Sources used: Ilona database, Kansaa teatterissa – Helsingin kaupunginteatterin historia by Pirkko Koski & Misa Palander, Näyttämöllä – teatterihistoriaa Suomesta by Pentti Paavolainen & Aino Kukkonen, Tasavallan toinen teatteri – Tampereen Työväen Teatteri 1964–2001 by Panu Rajala. A very stylish replica watch, this is a great gift.best replica rolex watches uk It looks very sturdy and it has a certain weight. Here are some tips for buying replicas, rolex air-king watches and we're sure it has a high quality and look.